In the paper, we recommend that you take a structured approach for managing information security with a continual improvement model. Learning from the continuous improvement model of managing ISMS, we emphasize is the need for constant updates, reviews and improvements in the way customers manage information security in the AWS Cloud. As an example, the table below extends the risk based ISMS approach and maps a recommended protection approach and multiple alternative strategies for data at rest security concerns. Accidental information disclosure Designate data as confidential and limit the number of users who can access it. Use AWS permissions to manage access to resources for services such as Amazon S3. Use encryption to protect confidential data on Amazon EBS, or Amazon RDS. Data integrity compromise To ensure that data integrity is not compromised through deliberate or accidental modification, use resource permissions to limit the scope of users who can modify the data. Even with resource permissions, accidental deletion by a privileged user is still a threat (including a potential attack by a Trojan using the privileged user’s credentials), which illustrates the importance of the principle of least privilege. Perform data integrity checks, such as Message Integrity Codes (parity, CRC), and Message Authentication Codes (MD5/SHA), or Hashed Message Authentication Codes (HMACs) to detect data integrity compromise. If you detect data compromise, restore the data from backup, or, in the case of Amazon S3, from a previous object version. Accidental deletion Using the correct permissions and the rule of the least privilege is the best protection against accidental or malicious detection. For services such as Amazon S3, you can use MFA Delete to require multi-factor authentication to delete an object, limiting access to Amazon S3 objects to privileged users. If you detect data compromise, restore the data from backup, or, in the case of Amazon S3, from a previous object version. System, infrastructure, hardware or software availability In the case of a system failure or a natural disaster, restore your data from backup, or from replicas. Some services, such as Amazon S3 Amazon DynamoDB, provide automatic data replication between multiple Availability Zones within a region. Other services require you to configure replication or backups. We think this new document structure will make it easier for you to find and understand the information you need. We are constantly launching new AWS services and adding features to our existing services. The number and types of services offered by AWS have increased dramatically. 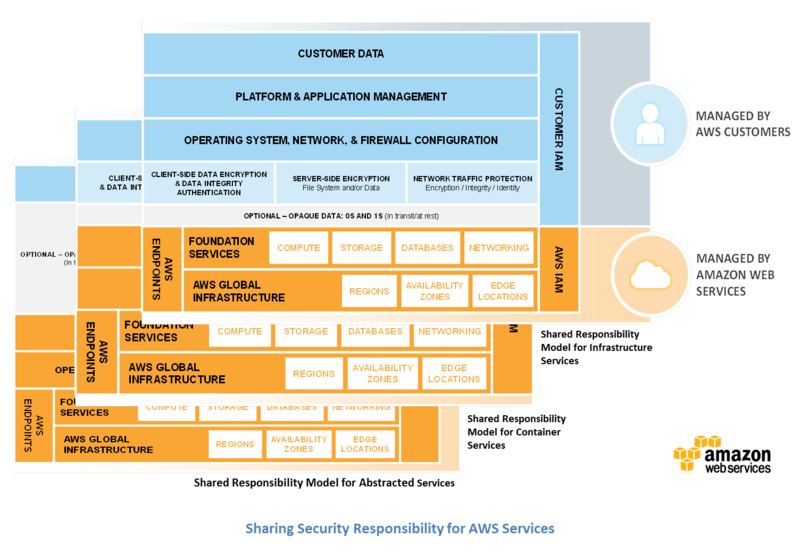 The whitepaper provides a clear description of AWS’s shared responsibility model and discusses the model in depth for different categories of AWS services: Infrastructure Services, Container Services, and Abstracted Services. This approach will help you to customize AWS security controls for your organization and help build a more efficient security posture depending on the services you consume. By using the various best practices highlighted in this whitepaper, you can build a set of security policies and processes for your organization and help you deploy applications and protect data quickly and easily.Like all whitepapers, this whitepaper is a “living document” and we plan to update this whitepaper as we introduce new features and services. We look forward to your feedback.